Swords & Stitchery - Old Time Sewing & Table Top Rpg Blog: How Druids of Doom (1982) From Judges Guild Saved My Gaming Life & More. 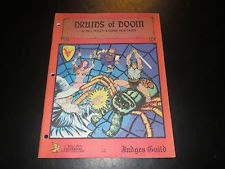 How Druids of Doom (1982) From Judges Guild Saved My Gaming Life & More. So its 2000 something and the D20 revolution is in full swing, and White Wolf is king of the gaming charts at the time. I'm playing their whole catalog of material and I'm starting to suffer from DM burnout. Everyone goes through it from time to time and back then I was stuck working some dead end no nothing job. Life was not great at the time, home was a hassle, I was working some nine to five that wasn't going anywhere. Something was in the air and I needed a major overhaul. It was time for a change and at the time I was hanging out at War And Pieces in West Hartford Ct. which I had been doing since the 80's. Anyhow I was sick of the whole D20 scene at the time until a hippie friend of mine Scott pointed out one of those Judge's Guild module packs that W&P used to sell. My guess was it was back stock from a warehouse that had been prepacked to sell off. Anyhow this former older 'stoner' friend of mine Scott cornered me and told me what I needed was an infusion of the 'good stuff'. Judge's Guild was the good stuff and all of this newer stuff on the market was simply re marketing of tried and true concepts. He was telling me about his PC's adventures in the 'City State of the Invincible Overlord.' & all about the his game on Saturday nights which I was free to join. Those were fun as hell but those are a whole other story for another time. What the hell, I grabbed two of these packages of Judge's Guild modules and left for the day. Well, inside one of these packs was Druids of Doom from Judge's Guild, and I read the damn module again and again. This wasn't my first Guild product by any means but I hadn't read one in close to ten years or so. So what was so special about a module from 1982? Druids of Doom is pure Judge's Guild over the top old school goodness. This is only a forty eight page module with an over arch adventure that goes right into the heart of a mini campaign and it dove tails in quite nicely into other adventures that they had put out over the years. The House of Euklidies, a temple to Astokph the Diety of Travel and Transporter of the Dead, is asking for a group of adventurers to recover three lost magical items of the temple. Adventures must pass through the portal and enter the Druid's Keep to recover them. Contains 6 maps, 5 new monsters, and over 60 NPCs. A Judges Guild Universal Fantasy Supplement by Bill Pixley and Diane Mortimer. Cover by Wes Crumb.Judge's Guild like so many of the smaller press old school companies broke the conventions and rules of the time. They mixed in elements of science fantasy, weird monsters, and lots of other stuff that I have since learned was really the norm for OD&D style products. But Judge's Guild did it with style and panache all their own. Pass through the portal? Well yes, one of the JG conventions is the idea of gates allowing adventurers to pass from world to world of the DM's design years before Star Gate was even a movie, let alone a television show. The other thing about JG products was the inclusion of all kinds of fun concepts like minor gods and goddesses who governed over many different types of aspects of life. This was like a freaking revelation to me? 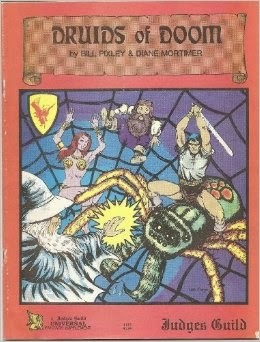 Wait AD&D 1st edition and OD&D had another company that was producing concepts way,way, ahead of its time? Yes they were and they were very,very, good at it in my humble opinion. You have to remember that I was out of the other end of the gaming loop at this time. D20 was sort of taking the world by storm at the time but it wasn't until years later in 2008 that the Open Game license allowed me to discover Retroclones and kick back into old school gaming. Needless to say that I grabbed my trusty AD&D 1st edition players hand book and ran Druids of Doom for some friends whose 3.00 edition game imploded upon itself. I ran Druids of Doom and then the other modules that were in those packages this included the Portals of Tosh series. Judge's Guild material was and is a part of my gaming DNA. I owe that brand a particular debt of gratitude . But that's a story for another time. Now Druids of Doom was really a eye opener on a number of levels. First it taught me to loosen up with my approach to gaming again, second it taught me that buying into typical fantasy tropes of D&D was very limiting, and it also resparked the old school fire that had gotten me into the game in the first place. Later I would inherit two binders full of material from this same friend who died of cancer. You see Scott my 'stoner' friend wasn't simply a stoner or hippie at all. He was a Vietnam era special forces veteran and friend. He was a decorated vet, who was actually one of the best war gamers I've ever known. He watched out for me during a particularly rough patch of my life because my dad had asked him to.All throughout my life there have been gamers like Scott who have passed through my life and my table. People whose presence pass through your life and who you don't realize until much later when your older and wiser just how important they were too you until you are stopped dead in your tracks by a memory of a friend whose passed on. Funny how gaming is sometimes that way. Its always the simple things that stop us dead. I really miss the hell out of War and Pieces and Scott. Do yourself a favor and pick up Druids of Doom, grab some friends and make your own old school memories. Excellent story. Sounds like a good friend. I can't tell how many close friends I've met through gaming, who've had my back. Thanks for sharing. Awesome. I like the mention of the "Portals" series. Portals of Torsh (the first in the series) is actually my 2nd favorite module of all time. Gaming has been one constant in my life for a very long,long, time. And friends have always been a part of that as well. And your very welcome. More coming up. I have a ton of experience with the The Portals series and some of the other Old School Judge's Guild products as well. If your interested I'd be glad to do more with that material on the blog as well. Let me know R.J., I'd happy to put those up as well.